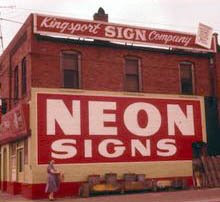 Worley Lane worked for Kingsport Sign Company for more than 40 years. These are from his slide collection. 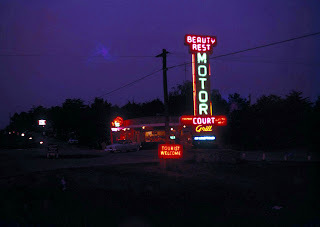 This great neon sign was for a motel on the other side of Rogersville. 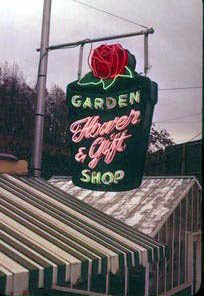 A Kingsport flower shop with a great neon sign. 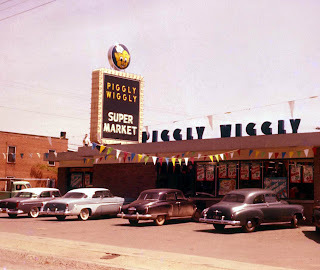 Piggly Wiggly was for a time one of the few places in town that sold beer. Note all the cars. Hey Estes Kefauver! 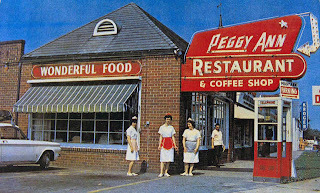 Move so we can see the Peggy Ann. 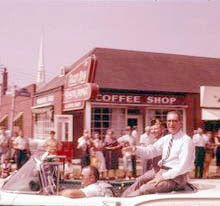 From the 1955 4th of July Parade. 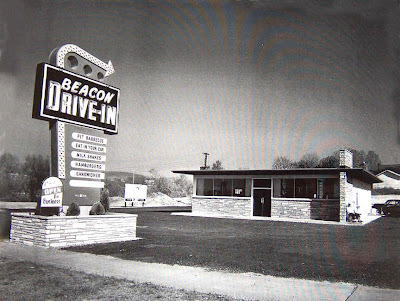 First it was the Beacon Drive In. 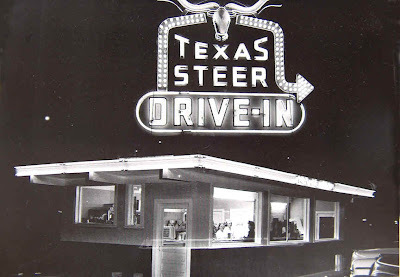 Then it was Trayer's. 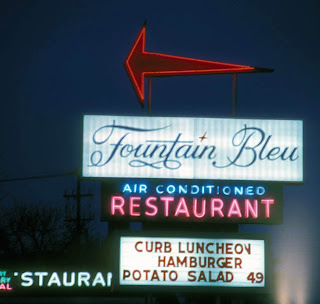 And then it was the Fountain Bleu. 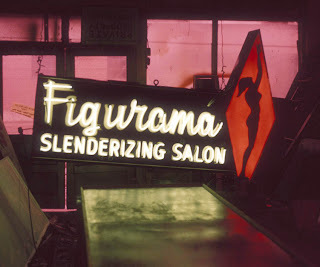 Did you lose weight at Figurama? Did you keep it off? Market Street after dark. 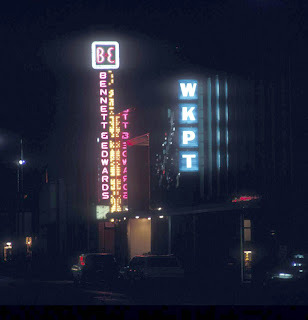 Note the old Times News neon sign with a clock above it. Sift together flour, soda, salt and baking powder and set aside. Mix beaten eggs, sugars, oil and vanilla and beat well. Add dry ingredients and beat well. Stir in oats, and/or raisins and nuts. Drop by rounded teaspoonful (or use a cookie scoop) onto baking sheet. Sift together dry ingredients; stir in rolled oats and raisins. Stir in oil, eggs, and milk. Beat with a spoon until thoroughly blended. Drop by teaspoonfuls onto an ungreased baking sheet. Bake at 400° for 10 to 12 minutes. 1/2 teaspoon soda in 4 tablespoons hot water. Beat eggs together and add other ingredients in the order given, mixing with each item thoroughly as added. Drop by spoonfuls on buttered tins and bake in moderate oven. Mix oil, brown sugar, eggs and vanilla until well blended. Combine the flour, baking soda, salt, cinnamon and nutmeg; stir into the sugar mixture. 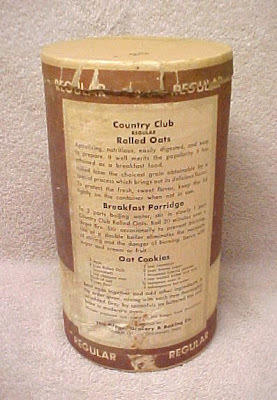 Mix in the oats and raisins last. Drop by rounded spoonfuls onto greased cookie sheets. Allow to cool on baking sheet for 5 minutes before removing to a wire rack to cool completely. 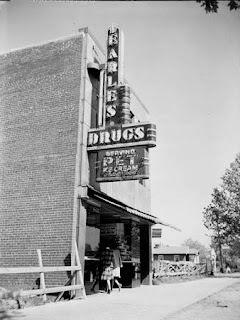 All photos are from the City of Kingsport Archives. Can you read the recipe off the label? I can't but maybe a sharp-eyed reader can. If you can email me. FLASH!!! eBay seller Don Castleman kindly copied the recipe off the label and emailed it to me! 2 eggs, 4 cups Rolled Oats (uncooked), 1 cup chopped nuts, pinch of salt, 2 cups flour, 1 cup cocoanut, 2 cups brown sugar, 1 teaspoon baking powder, 1 cup melted butter and lard, 1/2 teaspoon soda in 4 tablespoons hot water. Mix dry stuff. Add oats, fruit and nuts. mix some more. add in this order: oil, eggs, milk. Blend well. drop by teaspoons onto ungreased baking sheets about 1.5 inches apart and bake at 'bout 400 for 10 or 12 minutes. Says it makes about 6 dozen. Christine suggests using chocolate chips rather than raisins as a variation. 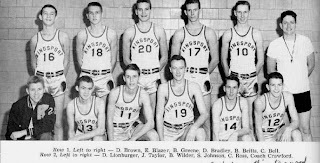 This is the D-B B-Team in 1962-63. Note "Bobby Dodd" jerseys number 23, 24, and 19. This is the 1953-54 D-B varsity, wearing the "Bobby Dodd" jerseys. And here we have the real Bobby Dodd jerseys from the 1925-26 D-B team. Here's a link to the Kingsport Yearbook Project, where I found the bottom two pictures. That's what a patent looks like. It's also what Bruce Haney looks like, holding one. Bruce's patent, which he got in the mail last week, is for his Fiddlewidget (TM), a slide rule device for music studies. If you want to watch a demonstration video of how the Fiddlewidget works click here.